Shin splints are a common injury that many runners and other athletes experience. When the muscles in the legs are overworked, this can result in shin pain, so stretching both before and after a workout or game is important. If you’re experiencing shin splints, here are a few practical remedies that can relieve pain. Active rest means that you take some of the pressure off your shins, but don’t stop exercising. If you stop walking or jogging altogether, you’ll likely experience the same pain in your shins when you resume working out. Instead of running outdoors, work out on a low-impact machine like the elliptical or exercise bike. You can also swim to work out your leg muscles without putting pressure on your shins. Applying ice or a cold compress to your shins provides immediate relief from swelling and discomfort. Ice is also the answer if you notice that your shins are turning red or are tender to the touch. You can apply a bag of frozen vegetables wrapped in a towel to your shins, or put a few cubes of ice in a plastic bag wrapped in a washcloth. It’s important not to ice your shins fore more than 15 minutes at a time so that your muscles don’t become numb and lead to more pain. If pain persists, ice your shins every three hours or so until the swelling goes down. To help prevent and reduce pain from shin splints, consider using specialized sports tape to provide extra support and pain relief. For specific instructions on how to place the tape properly, check out this instructional video or visit KT Tape’s store for more details. 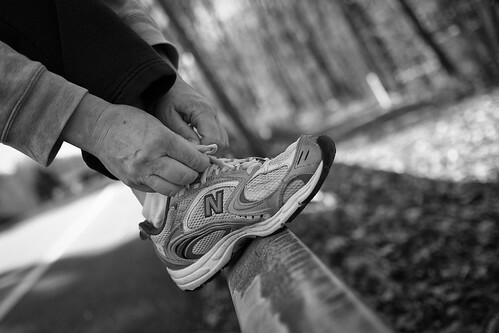 Running, walking or jogging in shoes that have weak soles or arch support can lead to shin splints. These shoes can’t absorb the shock of the surface you’re running on, which puts too much pressure on your shins. After you’ve gotten about 500 miles out of your running shoes, it’s time to replace them. If you’ve had shin splits in the past, make sure the surfaces you’re running on aren’t too firm. Make sure you’re engaging in high-impact exercises like running or doing aerobics on glass surfaces or all-purpose track surfaces that are design to absorb shock. Talk to your podiatrist about the specific anatomy of your feet and legs so you’ll know which shoes will protect you from shin splints. If you have flat feet, knees that invert or high arches, you’re more likely to experience shin splints. Your doctor will likely suggest specialized stretching exercises for you and/or provide orthotic devices for you to insert into your shoes to make walking and working out more comfortable. A combination of these treatments will likely help you avoid shin splints in the future. If you feel minor pain after exercising, taking a pain reliever after stretching can also help to alleviate discomfort.